There can be no timelier book than this. With the recent troubles in Ferguson, Mo., the issue of police “over reach” has come to the forefront of conversation. Particularly alarming to most people is the militaristic buildup of the local police forces with the use of cast off military gear. For instance, I live in a small town in Huntersville. We have a tank; maybe two. We also have body armor and riot gear that is more than sufficient for the unrest which will undoubtedly accompany the Second Coming of Christ. The question is whether or not we really need it. And if not; what danger does having it pose to the average citizen? In this book by Radley Balko you will find enough information to come to your own conclusion. From the Magna Carta on through our own Constitution, Mr. Balko has explored the path of the “Castle Doctrine” through an ever changing world. Whether or not you agree with his conclusions, this book will give you more than enough information to think things through on your own. To my mind that is the definition of a good book. The author charts the course of the Castle Doctrine; which simply put states that your home is your castle and you have the right to defend it. It was the cornerstone of English law, and became the corner stone of our own Constitution, enshrined in the 3rd and 4th Amendments by implication, if not design. He also charts the rapid decline of those rights as interpreted by an increasingly conservative Supreme Court. And it’s not a pretty picture. Beginning as early as the 19th century our rights under the Castle Doctrine were already being displaced by an increasingly large Police Force. To some extent this development has been necessary to meet the problems of growth. In colonial times there were almost no rapes, robberies were rare because you couldn’t sell stuff locally; making it unprofitable; and murder was not commonplace. That all changed as we changed; bigger cities, bigger problems. In the 1950’s Los Angeles Chief of Police Parker ushered in a new age of policing; basing his tactics on military strategy and firepower. By the Watts Riots of 1965 he saw the need for more militaristic policing and formed a squad of snipers and assault men. These were the first SWAT team. The term was invented after the fact by Parker himself. With the advent of the War on Drugs, and the War on Terror, the government has gained even more power and arms. The cast offs from the Patriot Act funding alone have armed most small towns and large cities in America to alarming levels. For the most part I agree with the author’s assessment of things. There is too much emphasis on military tactics rather than “Protect and Serve.” But at the same time these SWAT teams would never have happened had there not been a clear threat to law and order; as in the Watts Riots. And now, with homegrown terror groups openly advertising for the citizenry to arm, I have to start thinking of which gang I want to be part of. There’s Nazi’s and Aryans; they won’t do as I am Jewish. Then there’s the Right Wing Fascists; but they are Christian; again the Jewish thing prevents me from joining up with them. The Leftists are too far left and would muzzle me with politically correct speech; I talk too much and would never fit in there. The other various and sundry groups are all too small to make a difference and; for one reason or another; they won’t have me either. So, I’m left with the over militarized Police and Armed Forces. I guess I will have to take my chances with them for now. The one thing which bothered me about this book; which has a lot to offer; is that when covering the 1960’s and 1970’s the author never once mentioned the assassination of scores of officers; at least 4 in New York City alone; who were gunned down from rooftops while walking their beats. There was an epidemic of these shootings across the nation at the time. People in those neighborhoods mourned their loss. 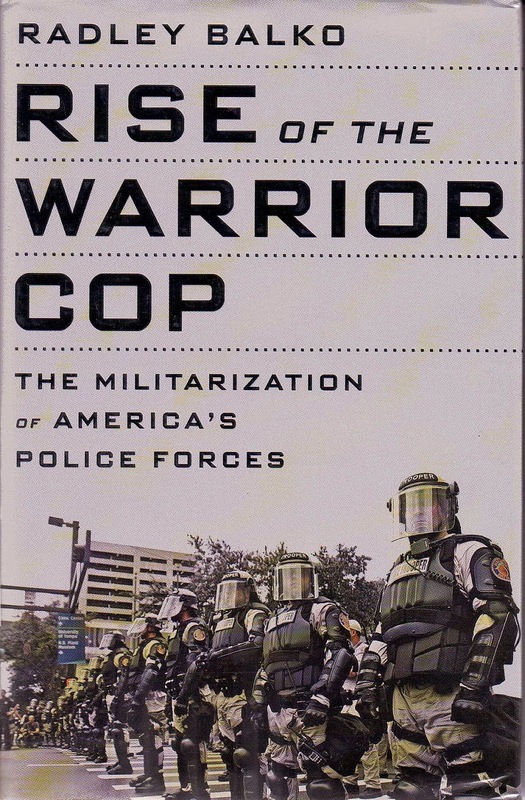 For a balanced account of how the militarization of the police occurred, these events must be taken into account. To leave them out calls into question the agenda of the author. There are abuses; to be sure; but to place the blame wholesale upon the police is a bit much. It took 2 to dance this waltz. At least some of the heavy handed tactics came about after the rise of the drive by shooting in the wake of the crack epidemic. It would have been nice to at least see this fact acknowledged by the author. To see a list of the police who were assassinated in New York City during 1971-1972, use this link to the NYPD Roll of Honor. These men were walking the street, armed with .38 revolvers; in their holsters at the time of their murders; by killers armed with high powered rifles shooting from rooftops in broad daylight. Some helicopters and automatic weapons would have been of great help in stemming the tide of these tragic murders, but the militarization of the police had not yet begun in earnest.